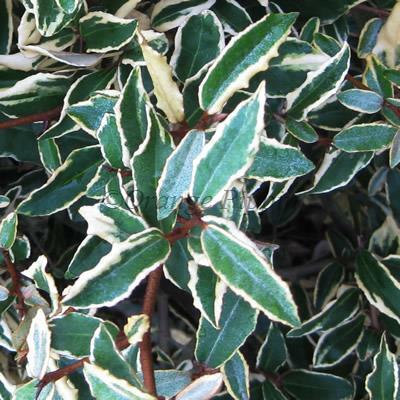 Elaeagnus pungens 'Hosoba-fukurin' also known as Silver Berry is a handsome evergreen shrub with bright green, grey, leathery leaves which are edged with gold. This sometimes thorny shrub produces small, fragrant, white flowers followed by bright red berries which are very attractive to wildlife. 'Hosuba-fukurin' is drought tolerant and can be planted within a mixed bed, border, used as hedging or screening and is perfect for the cottage or informal garden.